Since a long time, TV commercials or advertisings or simply ads have been more watchable to me than the ghostly serials around them. Brought up through the changing dimensions of televiewing and off course advertising, I feel to have developed a taste for them. Though it may be very personal taste; in most of the cases, I found the people agreeing to my likes and dislikes on the advertising matter. Watching, observing, thinking and criticizing (the very Indian way) I always felt to write about contemporary advertisements on Indian tube. So, here I’m writing my first post, Talking Ad(d)s! Lux for some reasons, commercial or trendy – whatever, secluded them from Sunny Deol, and ‘hired’ the Six-pack Khan “Shahrukh Khan ”. Otherwise media friendly Khan sparked another controversy ditching Reebok, accepting Todi’s endorsement for KKR. 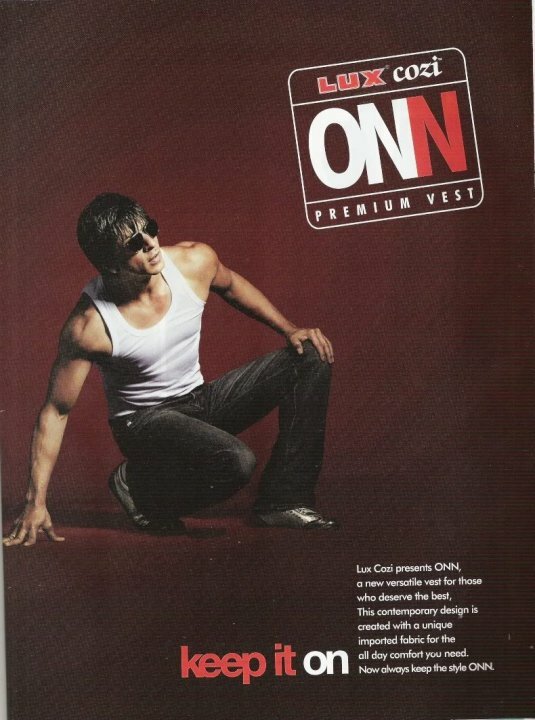 SRK line Lux ads flaunt his toned body in black and white ground with an ONN tag and "Keep it On" punchline. Nothing much on skin or dialogues to be talked about ;D, though this ad has actually eclipsed Deol's campaign all over the net. Akshay Kumar enters the Chadhi-baniyan arena, in his usual eshtyle, "Button khula hai aapka" and "Home delivery bhi karta hun" like dialogues with Dollars Club. All non-sense ad with unwanted fights and no-sense (forget dual-meaning thing) dialogues. While his first ad, where he plays a blind customer fighting goons at a bank, seems to be inspired from Aankhein movie, second tries to encash his chef-side safe image; both end with entirely no-sense dialogues. Fit hai boss! Bade aaram se You made this ad...Saif! Not very sure, but few years back probably Salman Khan was endorsing Amul Macho. I remember a still ad where Salman in vest was posing with a lion. Anyways, he’s nowadays endorsing Dicxy Scott. Change of personal preference, no comments! Hritik Roshan ’s Rupa Macroman ad too ends interestingly impressing a girl, dropping the curtain with Macroman emblem. I’m still in process to understand what ‘Live like a Macroman’ means! Chaddhi ka Chamtakar! Interestingly all the ads, are though representing some undergarment company, none advertises briefs. Few of the ads that I remember where a brief was actually shown on Indian TV, includes the infamous ‘Yeh to bada toing hai’ Amul macho; and Syed Zulfi’s Euro underwear ad where he gets kissed all over the body. Perhaps, it would take time to build the leg muscles for Bolly biggies to match the models; or some courage to bare all on national television. What influences you to select your brand? Haha this gave me a good laugh. Reminds me of a research I did years back for one of such brands. I was the joke of the office with laminated cue cards on my table of different designs!